Buy unique and personalised 1st wedding anniversary gift for husband online. Surprise gifts for marriage anniversary like customised beer mugs, caricatures! Photo collage frames are one of the most popular personalized gifts among friends and families. By looking at our wonderful photos we relive our mesmerizing memories. So, for your husband, why not collect twelve of his dashing photos and let our artist create this artwork for you? Printed in high-quality paper, and framed beautifully this could be the best gift for him. This one is the king of all collage templates. There is no limit to the number of photos you can add to this photo collage theme. Pull out all his facebook profile pictures, popular Instagram uploads, some of your wedding photos and your holiday pictures as well. And amongst this infinite spread of the amazing pictures, a bold and clear text saying - Best. Husband. Ever. This is a nice gift for your hubby, especially if it's the first time you are gifting him something after the marriage. Choose the best picture of your husband - one close up photo and the other a full body photo - will look best in this template. Below this, the meaning of a husband will be explained, not just the literal one, but a more meaningful and creative one. Gift your hubby this awesome beer mug. A fictitious word - Flawsome will be engraved on the glass, along with its made to believe meaning. An individual who embraces their flaws and knows they are awesome regardless. It is a fun gift for him, and he will surely love this creativing coming from you. So, be smart, and order this gift online for him right now. Another creative beer glass engraved design for your husband. A small superhero cutout figure, along with Super-husband text will be engraved on the beer mug. We also give you the option to add the name of your better half on the beer tumbler. He knows that you are the boss, and you know it too, yet calling him a super husband will really make his day. This is a no-nonsense beer mug for the happy and lucky husband. He is the best husband ever (period). This message is etched on the glass in a bold and stylish manner. Your partner's name can be engraved on the mug as well, which will make this one just for him. On his birthday or on your wedding anniversary, this could be a good surprise gift for him. Enjoy your special day with your husband drinking in personalized wine glasses. A simple yet classy engraving design, with your name on one of the glasses and this name on another. Buy him this gift, and tag along his favorite bottle of red/white wine to mark the anniversary or any special day. Wine glasses are quite a romantic gift if you personalize it the right way. Have you ever seen an engraving on a wine glass with Hindi text? No, right? We have created this design especially for a little out of the ordinary couples. Imagine all your friends asking you about this super creative wine glasses, and you couldn't help but boast about your uniqueness in everything you do. 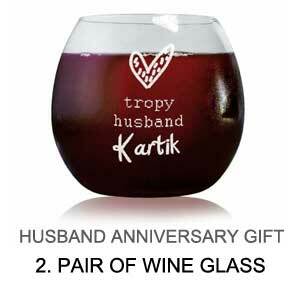 Gift your husband this super cool - "Mera Pyara Hubby" glasses. A husband-wife themed design for a set of two wine glasses. A clear and clutter free engravings saying - best hubby ever, and best wifey ever, on each of the glasses respectively. It's a perfect present for your husband, on your wedding anniversary, or on Valentine's day. Well, this one is so good, you don't need any special occasion to buy this gift. Just gift it to him! Hey there, we at dezains.com has all sorts of anniversary gifts for your husband. Surprise him with different caricature products. Your husband is a businessman, a banker, a pilot, a musician, an engineer, workaholic, we have themes for all the types. Artist hand draws the caricature based on the photos you provide, and then it will be used in the themes that you choose. Or if you want to go ahead a step further, you can customize the entire caricature artwork. Just describe your husband, his hobbies, his likes and dislikes, and our artist will make a cartoon depict of him. This is really awesome. Trust us, our customers, can't thank us enough for this uber personalized products. We have made many husbands and wives happy with our this special caricature gift. 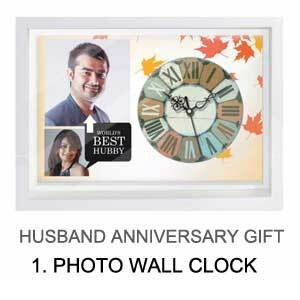 We have variety of 'couple themed' templates for this amazing wall clock. Personalized caricature faces will be drawn by our artist, by looking at your photos. Imagine having a funny yet romantic wall clock where you and your better half are striking an awesome pose. It will be a surprise anniversary gift for your hubby! The best selling gift for hubby, includes personalized bar accessories. Get any text engraved on high quality bar glasses, and gift it to your husband. Be it your anniversary date, your name or initials, or choose from our variety of templates. These wine glasses comes in set of two, and could just be the perfect gift for you two. Make this anniversary special by gifting this personalized product. Shop online and we deliver across India. We are sure, you guys must have many wonderful memories together, and already have a lot of photo frames around your house. But another brand new photo collage would always be a welcome gift. Select your new favorite photos, and pick any one of your collage themes to order this wonderful gift for your hubby. We are sure your anniversary would be nothing but special! People love personalized gifts! Your husband is no different. 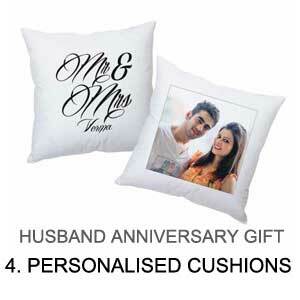 Go through all our stylish designs for couple cushion, and personalize it with your anniversary date or initials. The subtle design, with a touch of personalisation, makes these cushions useful for everyday use, and as a gift as well. These go well for birthdays and other special days. He’s your soul mate, the best companion for life – your beloved husband. Wondering how to surprise him on your anniversary? Stop Worry! You have just landed to the marvelous zone of wonderful collage of amazing gifts which will touch his heart. Dezains offers you a wide collage of unique gifts for your partner that ranges from Crystal Frames to Caricatures. You can also personalize these gifts to make it special for him. The answer might be quite simple, but it all depends on how much time you really want to invest on buying the perfect gift for your husband, that will make him really happy and take him to surprise. ✔Personalized bar accessories : Personalization can be done, by text, holograms, logo, symbols etc engraved on the glasses. We have made many pre defined templates, that will suit the occasion, romantic designs, and you just need to add your touch - name, quote, whatever. These generally are quite a useful yet very unique gift. The range includes beer glasses, champagne glasses, shot glasses, hip flasks, and more. ✔Photo Wall Clock for the best Husband: In our photo wall clock product, you can use 2-3 photos to create your own personalized wall clock. The templates are really creative, and you can give a personal touch to the gifts by adding your anniversary date or message on the designs. ✔Couple Photo Mugs: Our designers have created anniversary designed templates for coffee mugs. Have a look at those, and you will end up buying a pair for your home. These little things matter, when you want to show how much you love your husband. We at dezains.com, make all kinds of personalized gifts, that you can get delivered across India. Be it in big cities like Mumbai, Delhi, Kolkata, Hyderabad, Chennai or smaller cities like, Pune, Bangalore, Chandigarh. We deliver pan India. You will find few creative and very special personalized gifts, that are unique to dezains.com. Surprise your husband with a romantic anniversary gift from dezains.com. Be it your first wedding anniversary gift, or 5th anniversary gift, you will find the perfect thing to present. The very special gift that you can gift your husband on your anniversary would be caricature themed photo frames. We have amazing templates you can choose from. Looking for the perfect gift for 1st wedding anniversary? On your first wedding anniversary your could gift your partner cushions, personalized with his name and photo. During initial years of wedding, the thought given in finding the gifts matter more than the gift itself. Multiple personalized gifts will make him more happy, than a big pricy electronic item. There are many different photo products, that he will definitely like. And with any gift, you can always add a super personal touch by making an card, all by yourself and gift it to him on the special day. And trust us, this would be the most treasured gift of all. ✰ Plan a Party: For a social couple that loves to entertain, honor the milestone event by throwing a 1st anniversary party. Invite friends and family to the couple's home for a night of dinner and drinks. This is a great way to relive the marriage night. Make it personal by including touches from the wedding like a mini version of the wedding cake or the same flower arrangements. ✰ Romantic Night Out: A great way to spend quality time together is to plan a romantic night out. Make reservations at a favorite restaurant and then go out for dessert or dancing. ✰ Romantic Night In: A romantic night in is just as satisfying as a night out on the town when loved ones are together. Nothing beats a home cooked meal with a glass of champagne over candlelight. Remember to have a dessert ready for later like chocolate covered strawberries or favorite ice cream. ✰ Dinner at the Wedding Reception Location: Take a trip down memory lane and plan a romantic dinner at the wedding reception site. This is a nostalgic way to honor the 1st wedding anniversary without any of the stress. ✰ Family Backyard BBQ: For the family oriented couple, throw a family backyard BBQ to celebrate the 1 year anniversary. This is a casual way to get both sides of the family together again. If the weather doesn't cooperate, plan a potluck instead. ✰ Second Honeymoon: A second honeymoon is perfect for the couple that loves to travel or just wants to getaway. Plan a trip to the same destination as the honeymoon or pick a new destination. A trip together is relaxing and a romantic way to make sparks fly. ✰ Watch Wedding Videos: If the goal is to relax, plan to watch the wedding video together or with friends and family. Curl up on the couch with fresh popped popcorn, snacks and reflect the momentous occasion. Sift through some of the wedding photo albums too! ✰ Renewing Vows: Renewing vows is a great way to re-solidify the commitment to each other on the first year wedding anniversary. Choose to have them formally renewed by a pastor, priest, or rabbi or just do them privately between one another. ✰ Champagne Toast: If there's not much time to plan, have a champagne toast. Pick up a chilled bottle of favorite champagne and toast to one year of marriage. This is a simple yet thoughtful way to acknowledge a 1 year anniversary milestone. A first anniversary is something to celebrate and a perfect time to reflect on the wedding day and all the wonderful memories the couple has together. Looking for Surprise Gifts to make your anniversary day special? ✰ Most likely you will know at least a little bit ahead of time that your spouse will be gone during your anniversary. Plan ahead for that day, by making plans with family or friends. Tell them that you will need a little cheering up that day and ask them to save the date and go out to dinner or to a movie with you. ✰ Don’t Spend it Alone! : I really think this is key. Whether you wait to celebrate when your spouse gets back, or you celebrate over Skype or some other way, don’t spend that day at home alone. Get out, spend time with friends, make the most of that day. Even if you can’t be with your spouse, it can still be a good (and memorable) day! ✰ Plan a Special Skype Date: If you can, set aside a special time that you can Skype with your spouse. Whether it be on your actual anniversaries or on another day it doesn’t matter, but set aside at least a little time just for the both of you. Maybe you can dress up a little or have a little surprise gift ready to show him, but no matter what you do make it fun! ✰ Send Presents: My husband and have a thing we started on our very first anniversary. We thought it would be fun to buy each other something from the traditional gift list. This list gives the year and what the gift ought to be made of. For example: the first anniversary is paper, the second is cotton, and the third is leather. We have had so much fun every year trying to come up with a new and unique gift to match the list!